1. 7 Colours change: Red, Green, Blue, Yellow, Cyan, Pink, White. 2. Smart Touch button : you can change the color by press the button, press it first the lamp light up, and press it again will change to another light. 3. Flash color changing mode. Press the touch button to last color,auto color changing mode works. 5. Energy saving. Power spend: 0.012kw.h/24 hours; LED life span: 10000hours. 6. 3D vision effect, especially in the dark or take a photograph, the vision thrill will be strong! 8.Very low heat-conductive, will not be hot after long time working,Soft warm light, will not hurt eyes. Please read the user menual carefully before using. And the goods not include batteries. 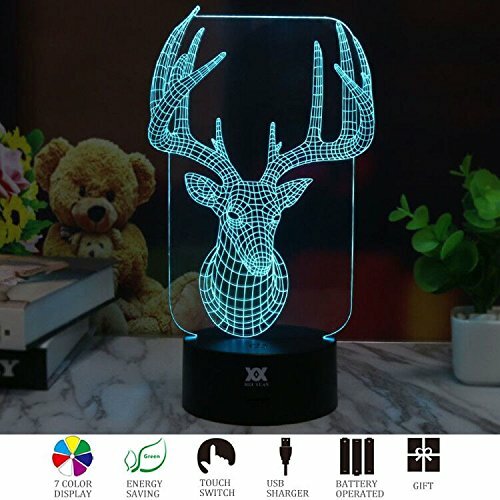 3D version effect-especially in the dark or take a photograph, the vision thrill will be strong.Acrylic material, the light will be more transparent. 7 Colors change: Red, Green, Blue, Yellow, Cyan, Pink, White. Smart Touch button, USB Connected or 3-AA batteries powered. If you have any questions about this product by Huiyuan, contact us by completing and submitting the form below. If you are looking for a specif part number, please include it with your message.